This article is dedicated to all animal lovers that are about to go online with pet-related content. 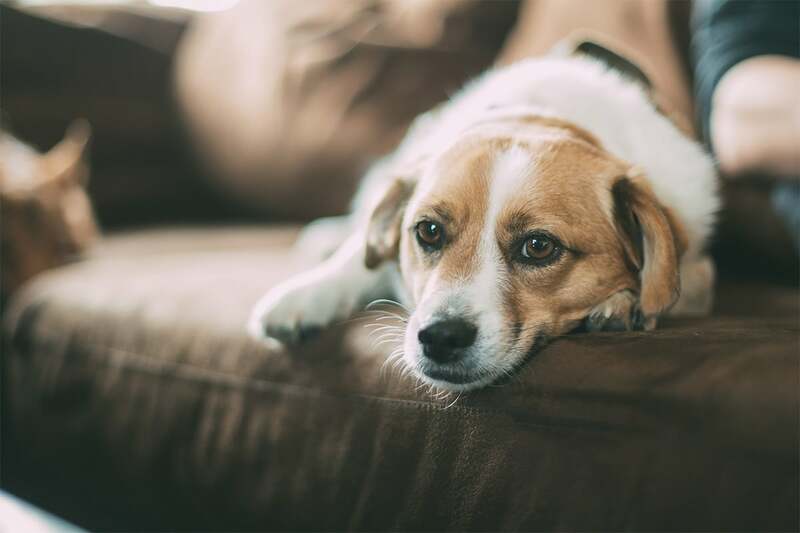 Exploring this roundup of the best animal and pets WordPress themes you will find a solution for any animal website. You can use these themes for non-profit organizations and e-commerce projects and premium WordPress plugins will help you with that. If you are new to this niche and don’t really know which theme fits your establishment best, you will find a solution in the list below. All the themes in this article are made in accordance with animal and pets niche requirements. This list is full of appealing designs supported by powerful plugins including drag and drop page builders. It doesn’t matter if your website if a cat or dog-oriented any theme from this collection would fit. 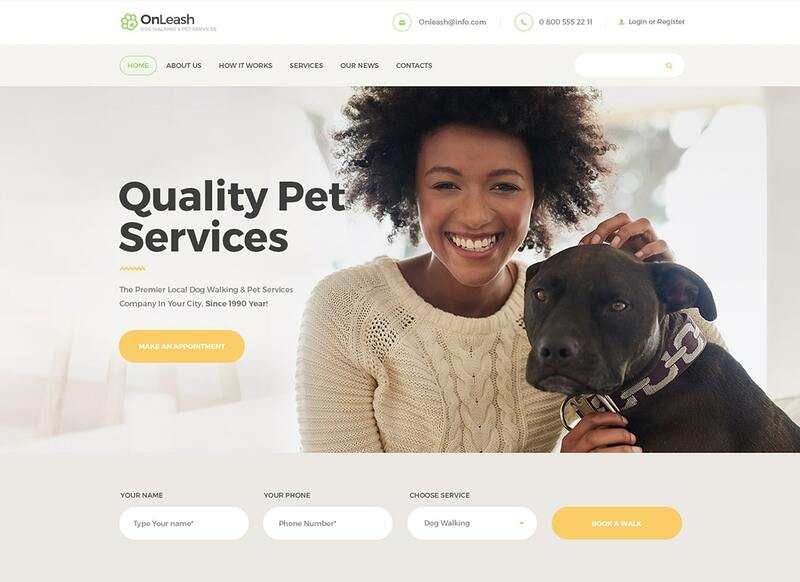 Using one of these premium animal and pets WordPress themes you build a strong performance for an animal-oriented establishment. Looking for a responsive WordPress theme that would suit well your animal-related website? Now you have it since this theme is made with a clean and valid HTML5 and CSS3 code which guarantees the most effective mobile performance. With this WP theme, you can manage appointments and organize your schedule using the website. This theme comes with readymade pages that cover different topics so you can choose the most relevant skin for the website. 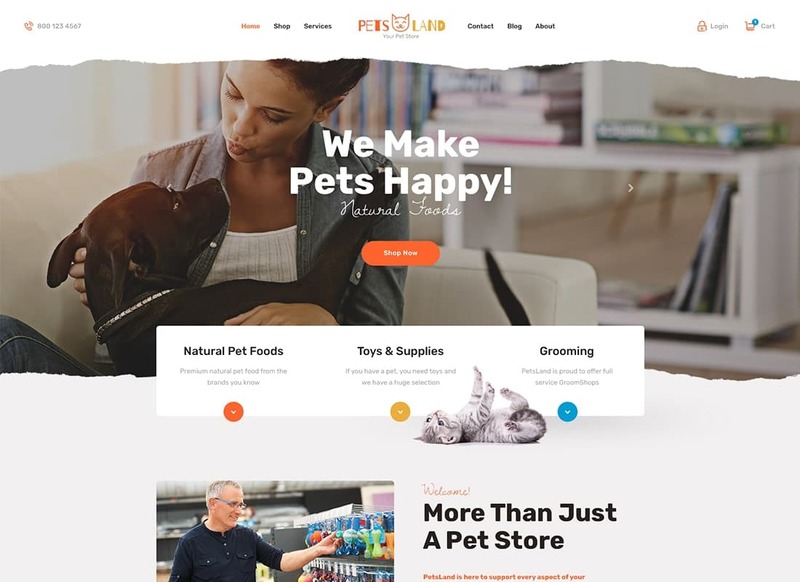 Pets Land is a stylish WP theme that is aimed to boost the popularity of a pets e-store. 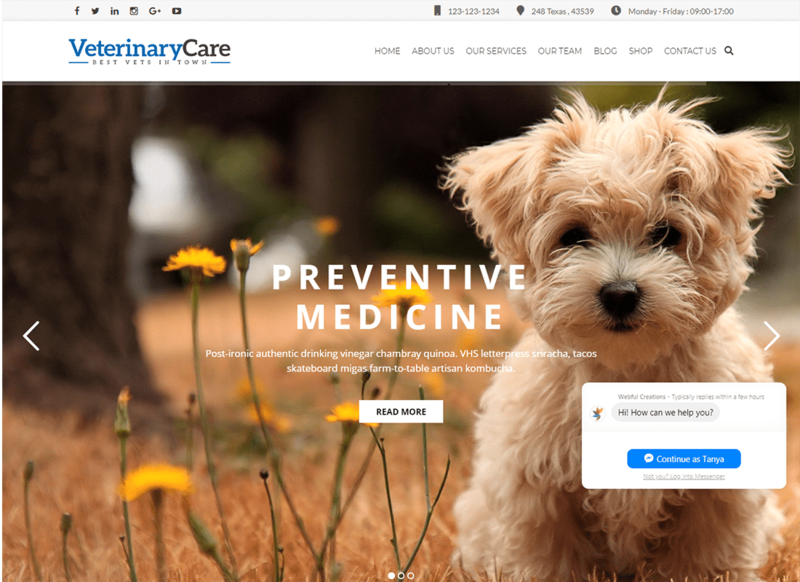 You can also use this theme to launch a website for a veterinary clinic as it features Booked Appointments plugin. Also, this theme has handy contact forms so your clients can get in touch with you when they need your consultation. With Pets Land you will merchandise effectively dye to compatibility with WooCommerce. There are lots of other awesome features that make this theme a worthy option. This theme is made for animal lovers, which is why it suits any website that covers animals. Your clients will enjoy its responsiveness and share your content on social media. This theme works in consonance with an appointments management system, booking system, and WooCommerce. Thanks to the last one you can conduct pages through the website. This plugin establishes the website with stylishly designed product pages and a comprehensive shipping cart. If you need a theme that would help you with the promotion of pet services OnLeash theme is the first stop. It is designed for e-commerce projects and features outstanding visual tools that affect visitors conversion. Another point that helps to gain the popularity of the website is a valid code which provides with an ability to reach the highest position in Google. In order to help you share the content with ease, there is a drag and drop page builder included. 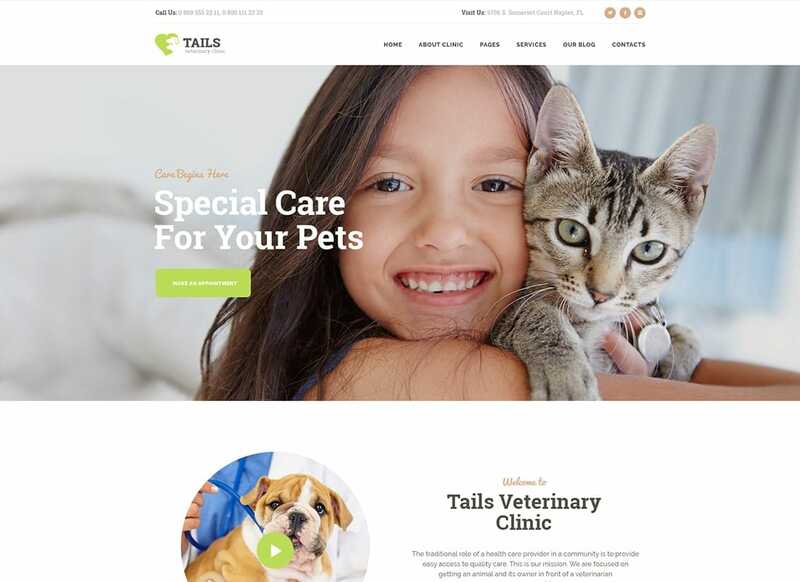 Tails theme is one of those animal and pets WordPress themes that look awesome on both Android and IOS devices. What is more, it adapts the content in accordance with the size of the screen. You will find the process of the content creation quite fascinating as all you need is to use your creativity and a handy interface of a drag and drop builder. Any coding knowledge is required. Apart from that, there are dozens of customization options in the theme options admin panel which you can use in order to establish a unique look of the website. 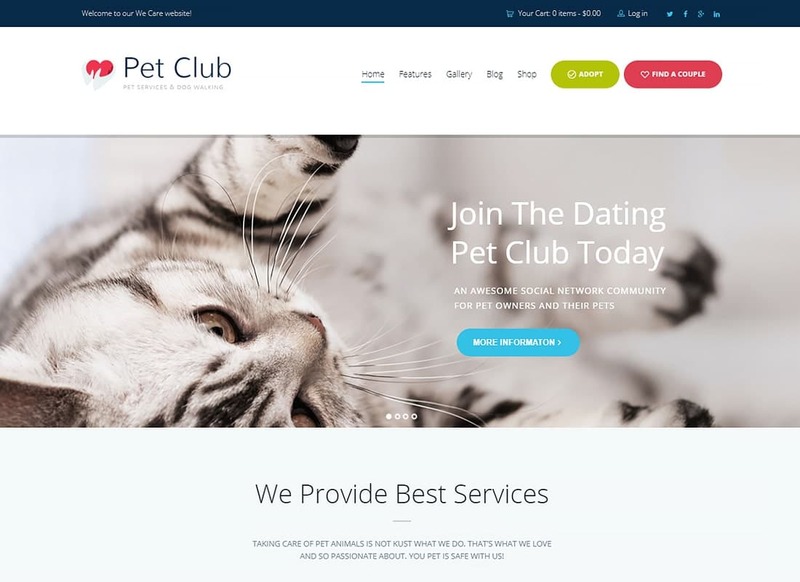 Pet Club is one of the freshest animal and pets WordPress themes with a high item rating. This one includes demos for a pet store, pet walking, pet club, pet adoption, and pet hotel. If you are running any other pet-related establishment you can use WPBakery page builder to adjust the theme in accordance with your needs. With this tool, you can craft unlimited designs and build a website of any complexity. With beautiful responsive sliders, you will create eye-catching presentations and promote your services in style. When you are picking a theme from the roundup of best animal and pets WordPress themes you know it is fully responsive. 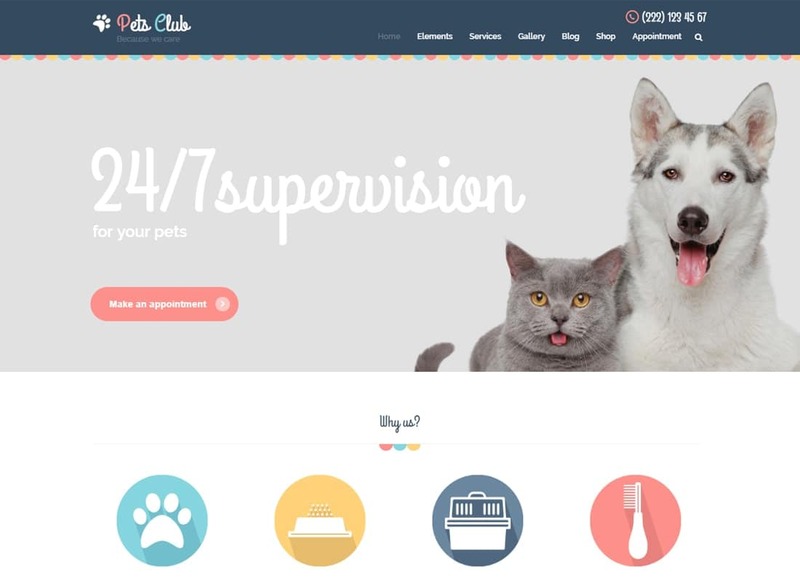 Pet Care theme is made by means of the high-quality HTML5 and CSS3 code, so it shows the highest load speed. There is an opportunity to manage your schedule through the website as it is compatible with WPBakery page builder. To boot, you get lots of widgets that empower the website with extra features. 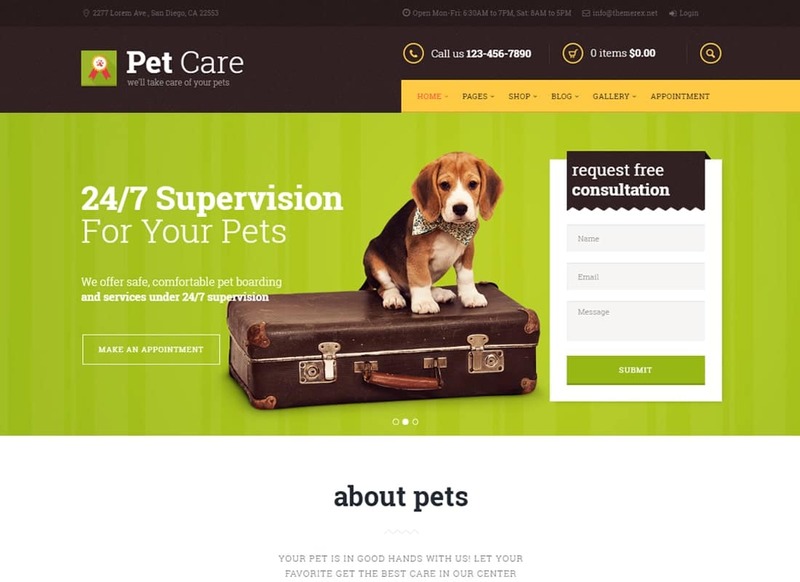 Pet Care includes all you might need for a pets services website. With this WordPress theme, you will create the most effective online platform for your business. 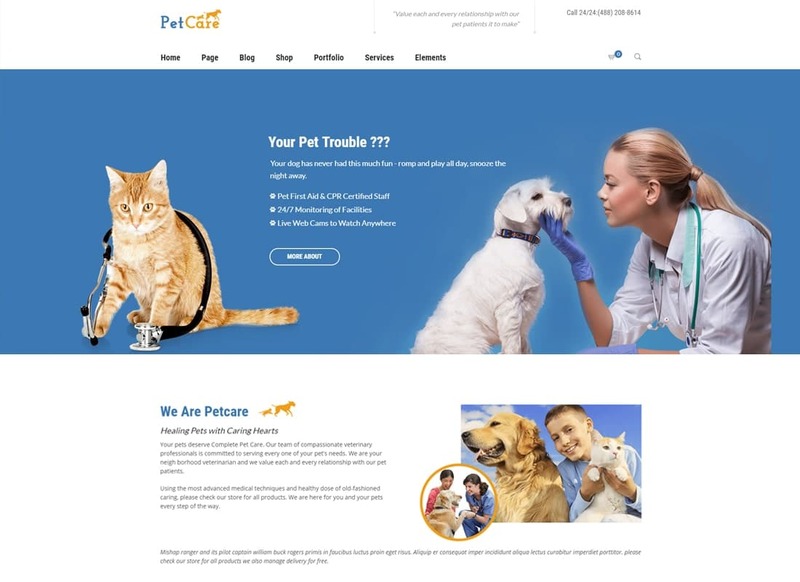 Pets Club is a cool option when comes to launching a pet care website as it comprises premade pages and lots of handy instruments for customization. Apart from that, the theme has a shortcodes builder so you could craft custom content. Awesome layout features allow housing this theme with boxed and wide page layouts. There are also However Effects and various header styles included. 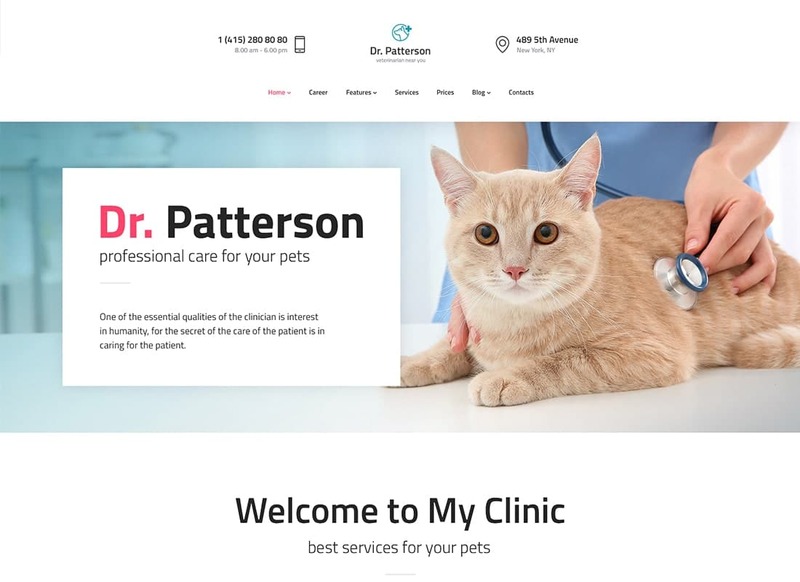 As Dr.Patterson theme is made for all healthcare websites it can be used for veterinary services as well. It includes 6 premade homepages one of which is dedicated animal services. It is perfect for online consultations as the theme is compatible with WooCommerce plugin. It means you can receive payments for your services right through the website. You will customize this theme in no time using such plugins as WPBakery, Slider Revolution, and ThemeREX addons. 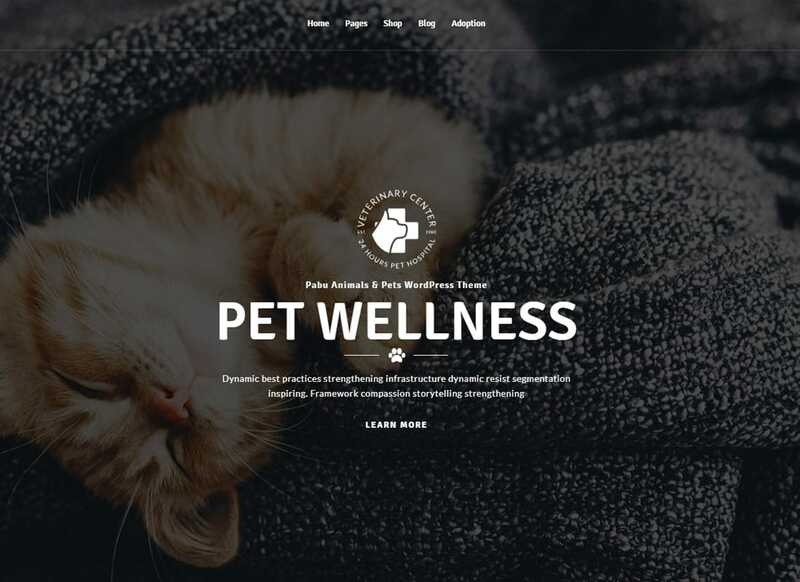 Need a versatile pet-friendly WP theme? Woof! theme is all you need. 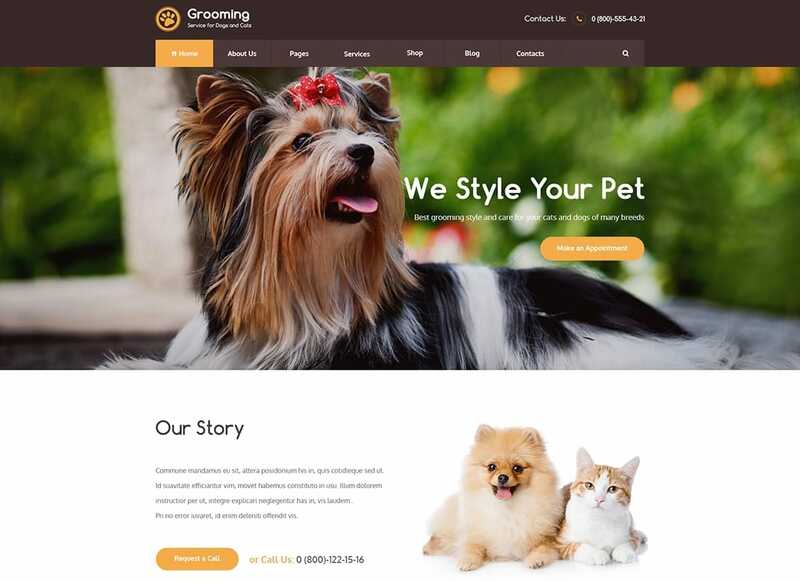 Gorgeous ready-made pages that cover different pet-related topics will suit pet hotel, pet adoption, pet services, pet walking, pet shop, and veterinary website. Thanks to the well-structured clean code this theme looks perfect on all devices and in all browsers. The code also affects the SEO of the website and allows reaching top positions in Google and other search engines. 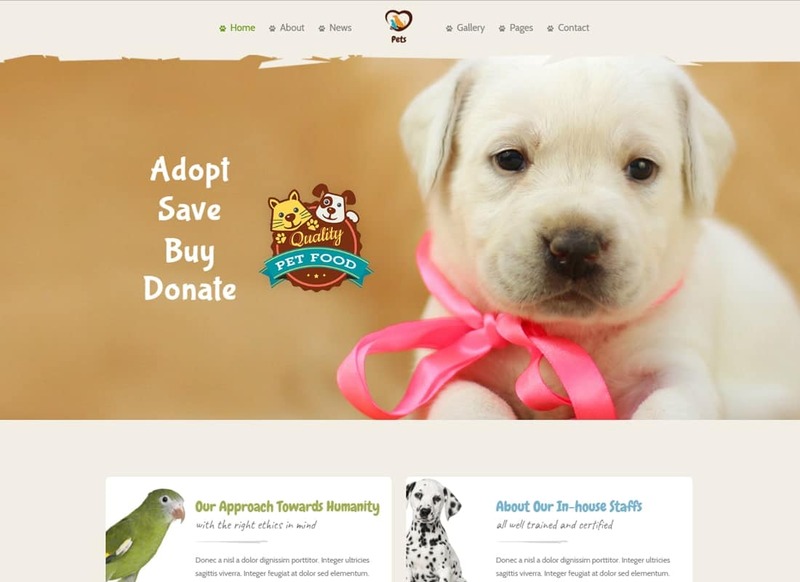 Pet World is one of the most multipurpose animal and pets WordPress themes. 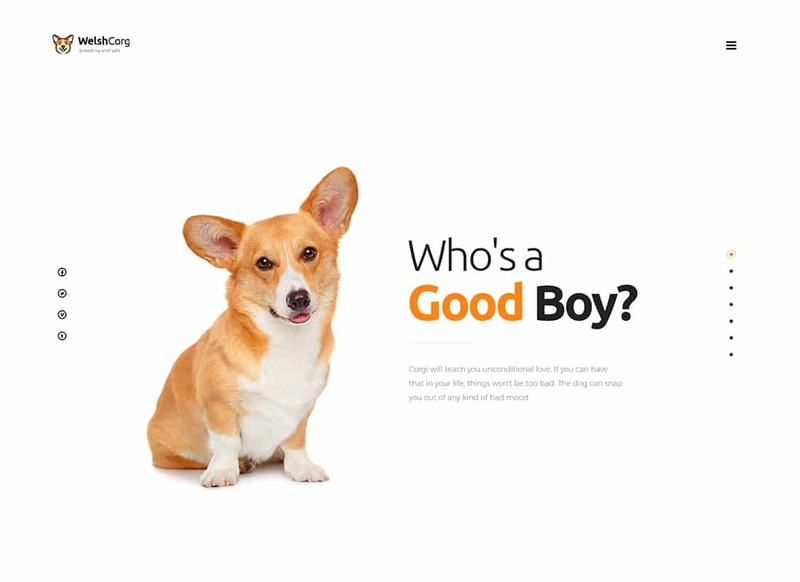 It comprises pages for pet shop and pet sitter. Also, there are classic home pages and services home page included. With this theme, you will create the most beautiful representation of your team as the theme offers several types of lists and gorgeous detail pages. 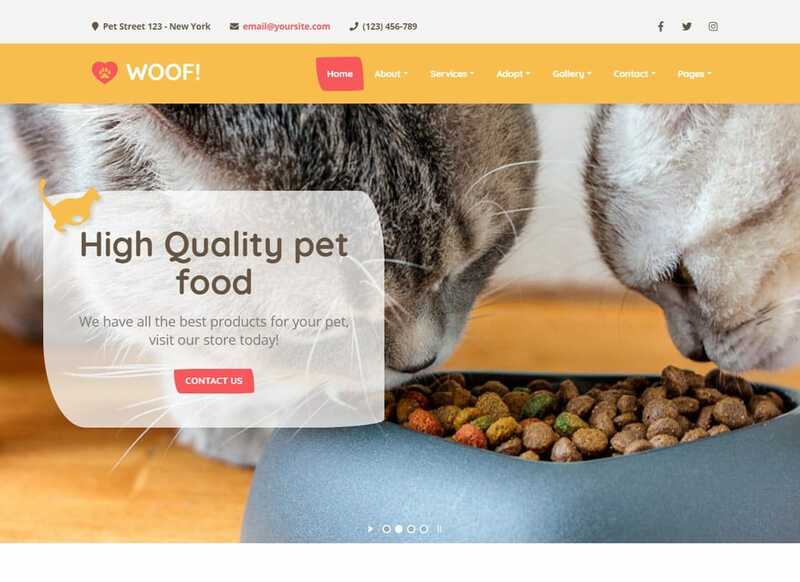 Pet World theme is compatible with such plugins as Tribe Events, All in One SEO Pack, WPML, WooCommerce, and much more. 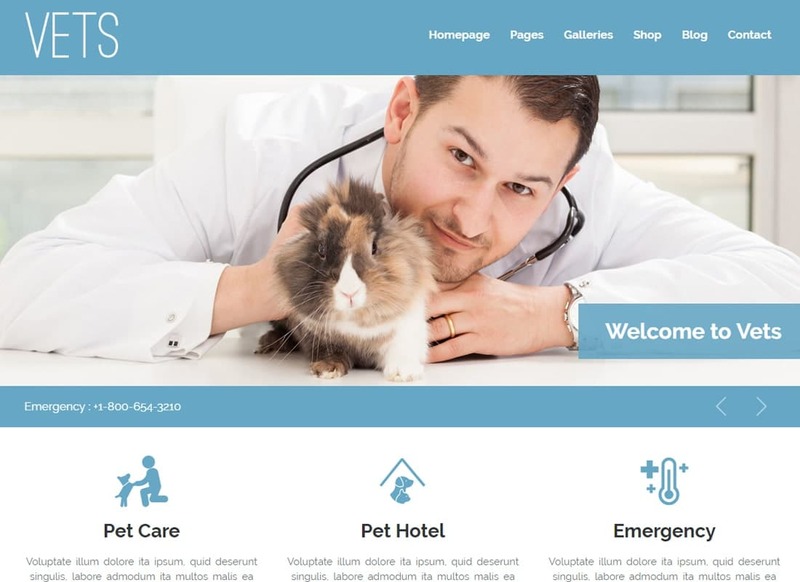 Meet VETS - a clean theme for veterinary services. This theme is based on a powerful framework which guarantees an uninterrupted work of your website. Moreover, this theme has lots of customization options, such as drag and drop page builder and a wide theme options admin panel. Thanks to the Jquery and CSS3 animations your content will look super-stylishly. VETS theme is responsive and adapts completely to all devices. Pabu is a freshly-updated WP theme for animal lovers. This theme features lots of predefined options which will save your time including layouts, color presents, and templates. 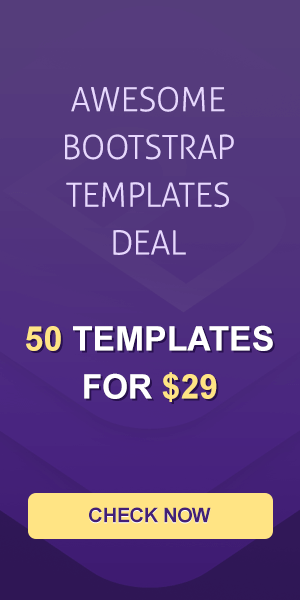 All the components are fully-customizable by means of a handy Visual Composer. What is more, this theme is equipped with a One-Click Installation which will automatically import all the theme demo data for you. You will find lots of shortcodes that will cover all your needs. 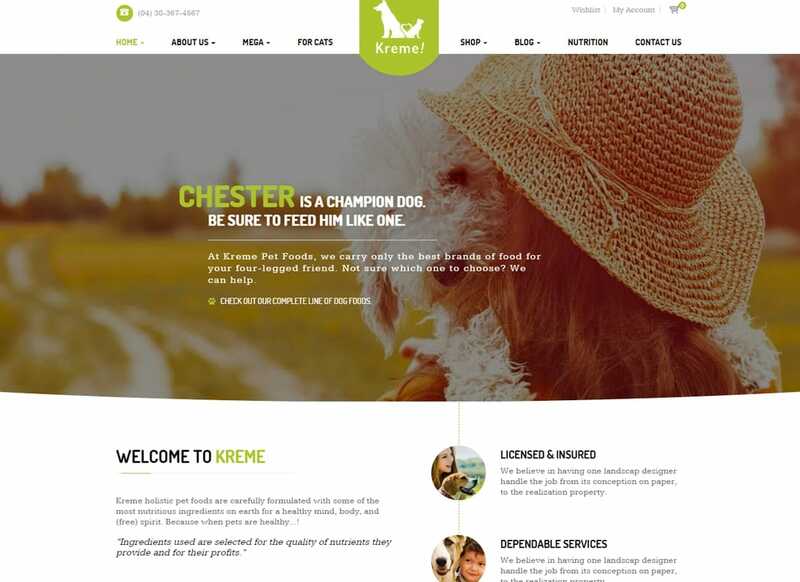 If you want to launch a pet shop quickly and effortlessly, pick Kreme theme. Its fresh design is appropriate for any occasion however suits perfectly e-commerce projects. The simplicity of this theme serves as a stylish background for the products and services you provide. Moreover, this theme is WooCommerce-ready which is a must for any e-store. The layout of the Kreme theme is based on a powerful page builder which requires no knowledge of the code. Are you wondering how the most popular thee among all animal and pets WordPress themes looks like? Then you need to check Pet Store theme out. It is a fully customizable WordPress theme supported with over 10 custom page widgets. You can create unlimited layouts using a handy page builder. Pet Store comes translation-ready so you can spread your products and services around the World. This is a perfect e-commerce solution for an animal-focused website. 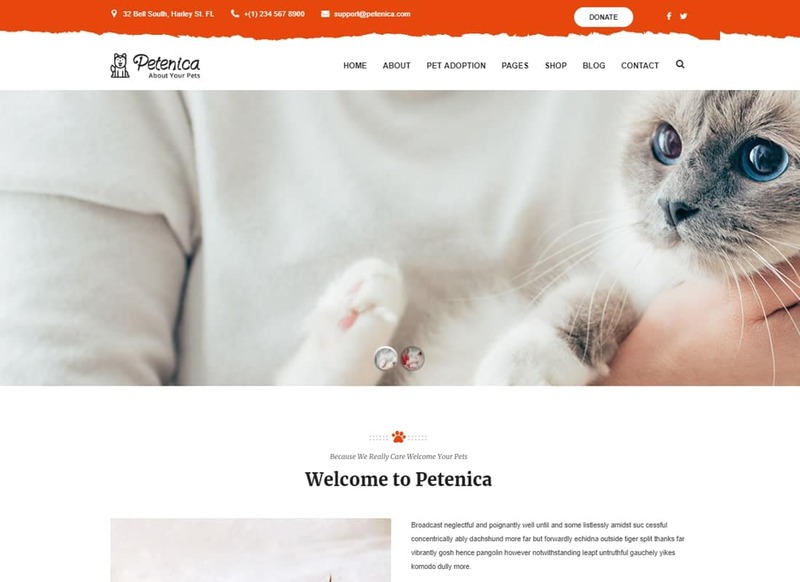 Petenica is a stylish customizable theme that would fit such websites as vet clinic, pet shop, grooming salon, pet adoption, pet sitting, and other pet-related services. It includes 4 beautiful homepages which anyone can customize without interaction with the code. Petenica comes with an awesome Adoption Management System and features a donation option so you can raise funds to help homeless animals. Using outstanding sliders you will create the most remarkable representation of your services online. Running a veterinary clinic? Launch a website with Vet Care to tell the wide audience about your healthcare establishment. This theme allows you to create an eye-catching representation of the content on all devices due to the absolute responsiveness and Retina image support. 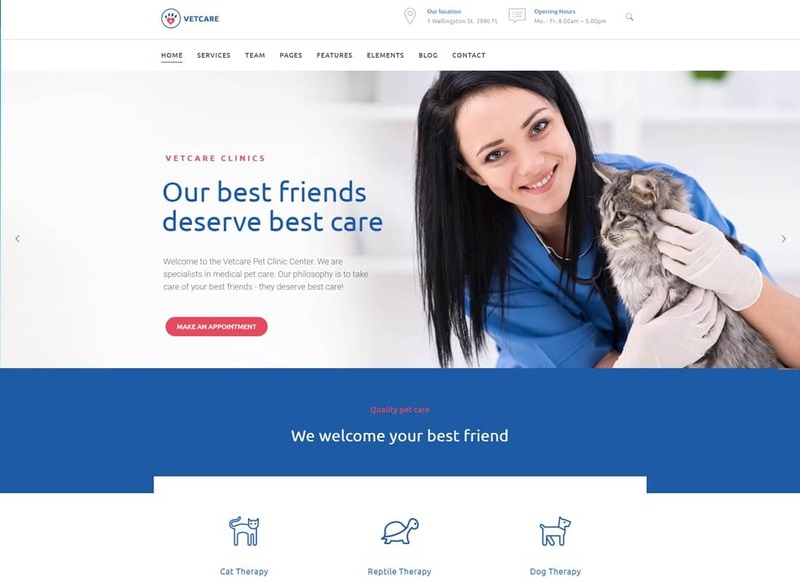 Vet Care theme offers several premade demos built with King Composer. This handy tool will help you to adjust the default design to your liking. 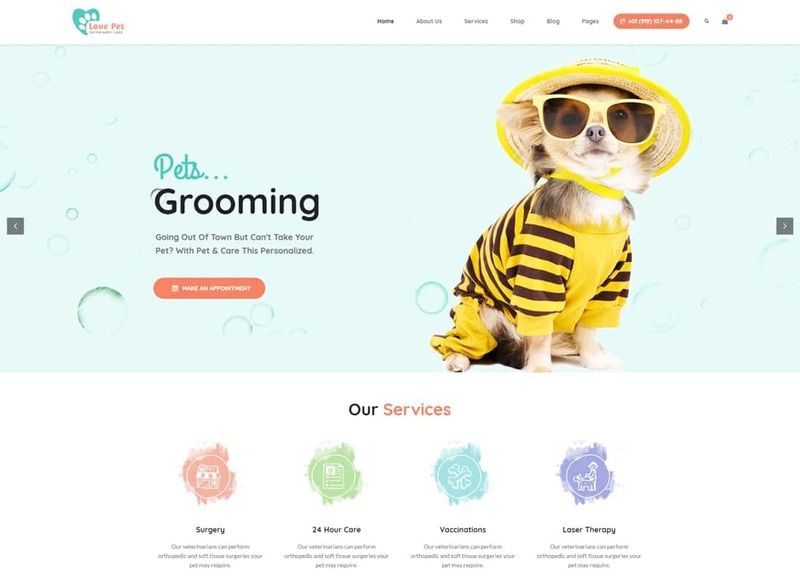 The nice and modern look of Whiskers theme is an ultimate solution for a pet store or any other website dedicated to pet services. It comprises demos for a pet store, vet clinic, and pet adoption. You will be able to create pets profiles and use the donation plugin. This theme is great not only for non-profit organizations but for e-commerce projects as well. Whiskers theme is fully compatible with WooCommerce so you can launch an e-store and get amazing results right away. If you want to build a reliable attitude for your vet clinic, Vetcare Medical will help you with that. This is one of the most powerful animals and pets WordPress themes since it is compatible with the most powerful WP plugins. Vetcare Medical theme offers unlimited color options and a huge collection of Google Fonts. It is integrated with stylish contact forms and Mega Menu which improve the navigation of your website. Another great option for veterinary representation is Petz. Awesome design of ready-made pages is super-customizable. 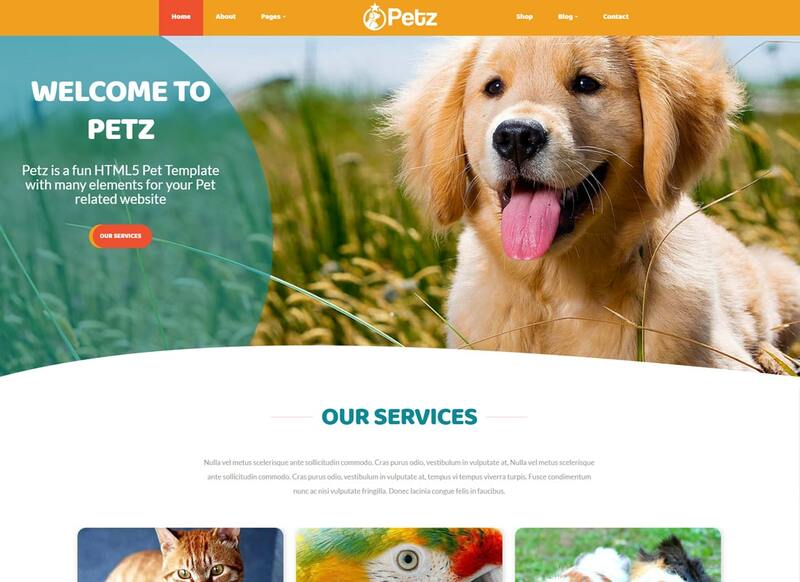 Petz theme is based on Bootstrap 3.3 and optimized for speed. Moreover, the theme includes an SEO plugin which helps to get more benefit of the online existence. As other premium animal and pets WordPress themes it gives an opportunity to adjust its design and functionality in accordance with your requirements and features plenty of tools that will help you with that. If you are owning a pet care business you need a responsive website to showcase your services online. 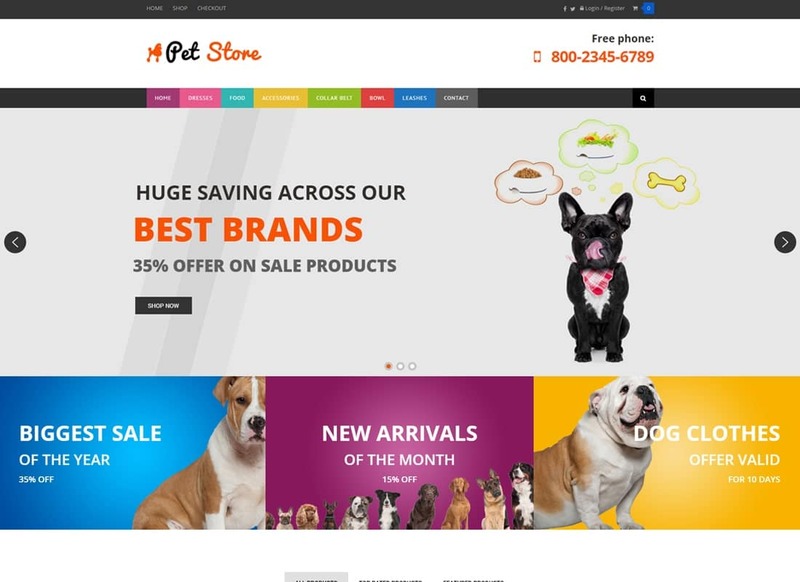 Petcare theme offers lots of custom post types and dozens of shortcodes which will help you to build an apple-pie design from scratch. It also provides you with an ability to spruce the default design with gorgeous typography and stunning animations. LovePet is your helper in online promotion. This one is great for all kinds of animal websites including vet clinic, pet e-store, shelter, animal adoption, pet training website, etc. As it is designed specifically for pet services website there is no need to change its look completely. All you need is to prepare custom content and combine it with a default design of this theme using handy drag and drop page builder. As this theme is WooCommerce-ready it is great for an effective online merchandising. 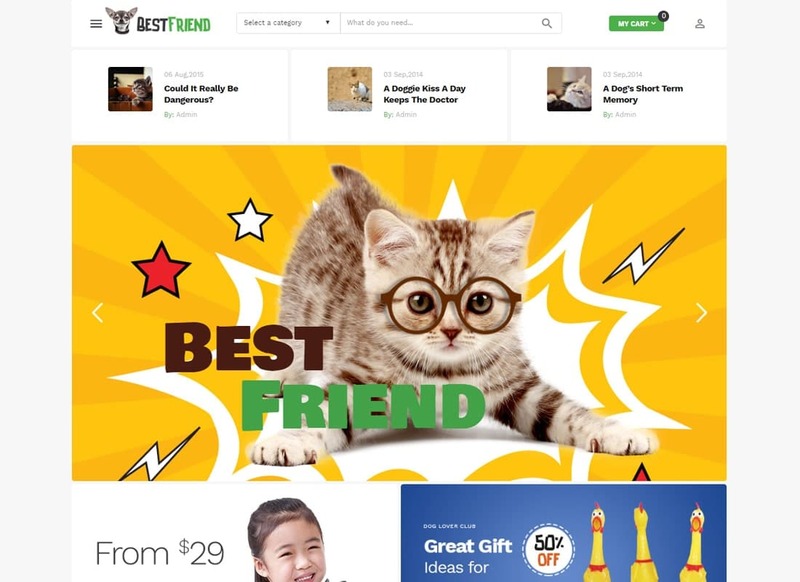 With Bestfriend you will launch an eye-catching pet e-commerce project it a flash. The first feature that will save your time and efforts is One-Click Installation which sets the theme up for you. Also, the fact Bestfriend theme is built with Kind Composer allows the creation of website design in live mode. Its bright and fresh layouts adjust to all devices and work smoothly in all browsers. 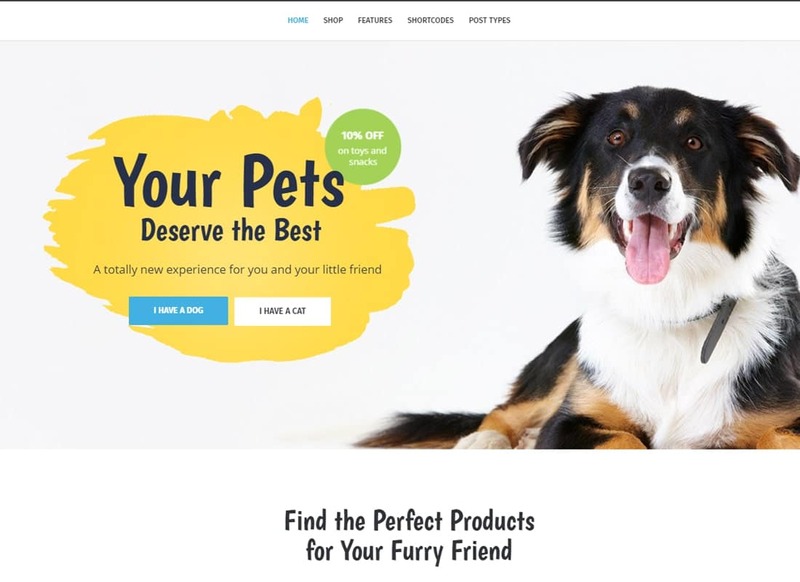 As lots of premium animal and pets WordPress themes, this one is made with a valid code which positively affects the website work.